The Formula Student Bizkaia team from the School of Engineering of Bilbao (University of the Basque Country), which competed in the international competition at Silverstone, reached the final for the first time and achieved four awards and the best position in their history in the race which took place last Sunday in the professional F1 circuit in the UK. The vehicle developed by these future engineers competed against the 118 vehicles developed by 2,000 engineering students from 24 countries and showed its superiority. It won the Award to the Best Electric Vehicle as well as the first position in Business Case, which makes it the prototype with the greatest business projection, the second position in Acceleration, as it achieved a time of 4.229 seconds, and the fifth position in Design. It is the second time that the team wins the Business Case award, since they did in 2013, but this year they received the highest score the jury has ever given in the 20 years the Silverstone competition has been held. Formula Student Bizkaia is an initiative which allows university students to learn by designing and manufacturing a prototype race car under real market conditions. 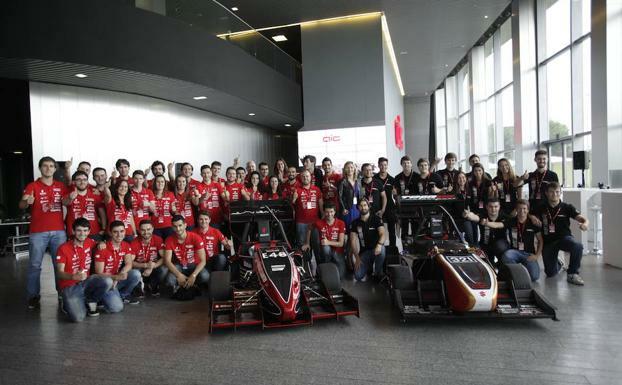 This year the team is made up of forty students from the School of Engineering of Bilbao, half of whom are taking a Bachelor’s Degree in Industrial Technology and the other 20 are taking Bachelor’s Degrees in Mechanical Engineering, Industrial Electronics & Automation Engineering, Electrical Engineering, Industrial Organization and Telecommunications Engineering as well as Master’s Degrees in Industrial Engineering, Telecommunications, Control Engineering, Automation, Robotics and Mechanical Engineering.